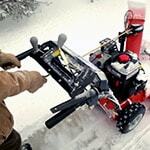 Home » How-To Library » Should I Buy a Track-Drive Snow Blower? Track-driven snow blowers will forever change the way you feel about snow. They are virtually unstoppable in the worst winter conditions, whether it's deep snow, slippery ice, uneven terrain, or steep and hilly driveways. Deciding if a track-drive snowblower is right for you isn't about how much snow you need to clear; instead, it's all about the steepness and terrain of the surface you're clearing. 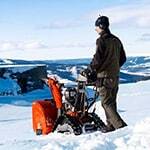 What is a Track-Drive Snowblower? Track drive snow blowers move just like a tank; the tracks give the snow blower maximum traction because they remain in constant contact with the ground on steep angles. 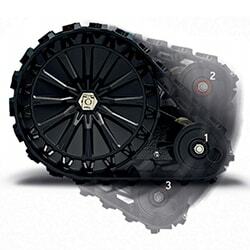 Snow blower tracks rotate around wheels that are usually arranged in two or three-point designs. Unlike wheeled models, track-driven blowers are safe to use on steep paved or unpaved surfaces because the wheels are safely housed inside slip-resistant tracks, meaning they won't slide around unpredictably during operation. Usually, track drive systems are available on two or three-stage snow blowers because of their more powerful engines that are built to withstand extreme winter conditions and heavier use. Most track drive snow blowers have turn-locks that won't allow you to turn the blower until a handle-mounted trigger is engaged. This ensures safe and intentional steering on icy surfaces. Additionally, some models have a variable speed control for easy, controlled operation. The major differences between regular wheel snow blowers and those with track-drive technology are maneuverability, speed, and traction. Steering a wheeled snow blower is generally easier to do because most track-drive models don't pivot on a single wheel. However, track-drive blowers now have turn-sensing technology that automatically helps to spin the machine in the direction you start turning. Traditional track-driven snowblowers are typically slower than wheeled throwers. Yet, innovations like RapidTrak technology is closing the speed-gap between tracked and wheeled machines. Other important factors to consider are packed-down, icy snow from vehicles and the snow banks created by snow-removal trucks at the end of driveways. Track-driven throwers are generally heavier and have settings to lock them down closer to the pavement to remove the densely packed snow and muscle to get through those icy snow traps. Unlike wheeled models, tracks have superior traction control and allow you to safely maintain control on steeper paths. Do I Need a Track-Drive Snowblower? The simple answer can be boiled down to safety and budget. Track-drive snowblowers handle every winter environment better than wheeled throwers. Generally, track drive models are more expensive, but you're paying for superior traction-control and safe operation on hilly terrain that wheeled models can't handle. If your driveway is level, you might get by fine with a wheeled snow blower. But if the area is steep or uneven, wheels alone won't give you the traction you need for safe and efficient operation. Though in the past track models may not have been ideal for frequent steering, evolving track-drive innovations from companies like Honda, Ariens, and Dirty Hand Tools now makes it possible to conveniently have the best of both models: the traction of a track-drive thrower with the speed and sharp turning of a wheeled snowblower. RapidTrak is a hybrid technology exclusive to Ariens snow blowers and gives the operator a choice between track-drive and wheel-drive on one snowblower for maximum versatility in any conditions. RapidTrak models have three adjustable positions and include an extra-traction setting for the harshest conditions. It's everything you'll love about a track-drive with the option to switch back to wheels if you need it. Unlike other track models, RapidTrak maximizes variable-speed operation while making sharp turns possible for models that utilize a hydrostatic drive transmission. Plus, they move faster than traditional track units, making it easy to clear larger areas quickly. 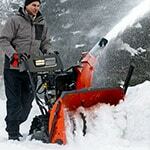 Should I Buy a Track-Drive Snow Blower?.. Our Power Equipment Direct how-to library can help you learn about Top-Rated & Best-Selling Three-Stage Snowblowers, Farmers Almanac Winter Weather Predictions and Proposition 65 Product Labeling.